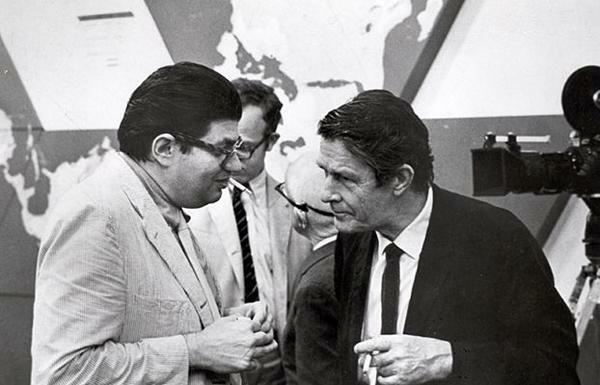 At the time they sat down together to chat for the radio, both Cage and Feldman were well-known—even famous—composers in the American avant-garde. Cage’s book Silence had appeared five years before and had propelled him to fame. His second book, A year from Monday, was to be released soon. This would contain the first installments of his “Diary: How to improve the world (you’ll only make matters worse)”, which reflected his increasing interest in social issues. He was receiving regular invitations to speak and perform at colleges and festivals. He was traveling extensively with the Merce Cunningham Dance Company, bringing his music to a global audience. This meant he spent a good deal of time on the road: immediately prior to the Radio happenings Cage was at Aspen for an International Design Conference, and immediately after the first two Happenings he traveled to France with the Cunningham Company. He spent the first months of 1967 as Composer in Residence at the University of Cincinnati. It is perhaps a sign of the measure and nature of his fame that, on the Friday following the recording of Radio happening II, Cage participated in a Stravinsky festival at Philharmonic Hall in New York, playing the part of the Devil in a performance of Stravinsky’s L’histoire du soldat (Elliott Carter was the Soldier, Aaron Copland the Narrator). Morton Feldman was not a star of the magnitude of Cage, but his music and reputation were gaining in Europe. He had received a Guggenheim Fellowship and used the money to travel to England in the spring and fall of 1966, giving lectures and meeting composers such as Cornelius Cardew. Feldman discusses his experiences in England during the Radio happenings, and it is clear that he is impressed with the English and they with him. His article “Conversations without Stravinsky”, first published in London Magazine in March 1967 (and reprinted that summer in Source) presents Feldman’s sweeping characterization of the English, European, and American musical scenes (along with references to recording the Radio happenings with Cage). Feldman and Cage talk about their current situations at various points in the Radio happenings. (I’ll give page references to the MusikTexte edition) In Happening I (34–37), Feldman asks Cage whether he would teach composition, but Cage doesn’t see how he could do it, relating it to his general problem “about how to continue my work as I travel around.” Radio happening III (80–91) opens with Feldman’s lengthy description of his travels in England, where, apparently, he played a recording of one of the first two Happenings at a lecture there. For those interested in the details of their works, Cage and Feldman describe a number of their specific pieces, often in some detail. On Cage’s side, he describes the beginnings of what would become HPSCHD (Happening III, 94–97), and he tells a wonderful story (170–73) about the Concerto for prepared piano (about which I wrote some time ago). There is even more revealed about Feldman’s music. In Happening II (48–51) there is the poignant story of the piece for electric guitar that he wrote for Christian Wolff, a piece lost to us after Wolff’s guitar was stolen (the only manuscript of the piece was in the case). Shortly after this (56–59) there is a description by Cage of Feldman’s Two pieces for three pianos: “three pianos, two of which are … coordinated and working in a way that is reasonable to them, whereas the third piano is working according to some totally other view.” At the time of Radio happening III, Feldman had just finished what he describes as “a large chamber work” (later titled First principles) composed much like the three piano piece: “three different things going on at the same time. They’re not really three pieces superimposed, they’re just three things going on to make one.” (106–09; 120–23) And finally, there is an extensive discussion of Feldman’s graph pieces in Happening IV (144–47), including In search of an orchestration, which was then in progress. And finally, there is this delightful exchange towards the end of the last Happening (182–85), where we really see these two men as supportive colleagues, as a discussion of the intersection of new art and new music suggests possible projects. The unexpected vulnerability of Feldman here (he clearly is not confident in his abilities in this sphere) and Cage’s cheerleading and encouragement is beautiful; but I wish Cage had succeeded and that we could have experienced what Feldman would have done with sound in space. After the final Radio happening broadcast in 1967, the tapes were put away at WBAI. Ann McMillan left the station shortly afterwards. Both Cage and Feldman continued their individual journeys as composers and friends, but to my knowledge never reunited on the radio again. The Radio happenings were forgotten, the tapes unheard—until they were handed over to me at an Indian restaurant in the East Village twenty years later. I’ll tell that story in the next and final installment in this series. The recording dates for Happenings I, IV, and V were written on the boxes for the master tapes. I have inferred the dates for the other two shows from references to current events made during them: in Radio happening II Cage notes the obituary of D. T. Suzuki (died on 12 July 1966), and in Radio happening III Feldman mentions an op-ed column by James Reston (“1966: A bad year for big shots”, New York Times, 28 December 1966). The last two Happenings were recorded in the same session and edited for broadcast as two separate episodes. My source for the details of Cage’s activities in 1966–67 is the chronology in Paul van Emmerik’s A Cage Documentary. The Stravinsky concert was reviewed by Howard Klein in the New York Times: “Music: Stravinsky’s Own”, 16 July 1966, p. 15. For Feldman, I relied on Sebastian Claren’s “A Feldman chronology”, translated in Chris Villar’s Morton Feldman says (Hyphen Press, 2006). The excerpts of the conversations are from my own digital copies of the Happenings.